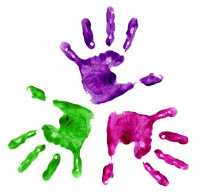 One simple fun way to teach your children their numbers in French is to make some handprints on papers with fingerpaint. After they dry, you can hang them up on the fridge and count the fingers in French once a day to review the numbers. Not into messy painting? A different way to achieve the same result is to trace your children’s hands on a piece of paper and then label each finger with a number. Remember when teaching the French numbers to your children to mix it up and have them count backwards. This will help them to learn their numbers in French without having to count up to a certain number. Thanks so much. It means a lot to me to read such kind words! Thank you for stopping by my blog. I love your site. What an awesome resource! We are learning Spanish at the moment, but I can’t wait to take your ideas and apply them to that pursuit. Thanks Carletta! Good luck with your Spanish learning. We teach a little Spanish in our home as well. It’s a very useful language! ← Things you say a gazillion times a day, but switch them to French!